How do you know if your customers are ‘showrooming’? The truth is that consumer shopping behaviour is changing; not only because of the Internet and online shopping but also through the use of mobile telephones and particularly smartphones. This change in behaviour is leading to an increasing problem for traditional retailers known as ‘showrooming’. ‘Showrooming’ is when consumers use a brick-and-mortar store to evaluate merchandise and to get hands-on with a product and experience all the senses; checking its size, feel, colour, look or smell in store, whilst actually complete their purchase online either via a smartphone or tablet. The reasons for this are often linked to price, availability of staff for assistance or the perceived benefit of avoiding the need to queue by having your item delivered. The easiest and most effective way for retailers to establish if showrooming is occurring in their stores and to measure the effect it is having, is to monitor each store’s conversion rate. A retailers’ conversion rate is calculated by dividing sales transactions by traffic counts. Retailers experiencing higher rates of showrooming will see their conversion rate drop as potential customers enter the store, but do not convert to actual customers by purchasing the displayed products in the store. Instead they will leave empty handed. Why will knowing that showrooming is happening and the ability to measure its impact be crucial to retailers in the future? Well; because it is having a negative effect on retailers’ bottom line. The consequence of customers enticed into remote, online shopping, is much the same as those who shop from home. They are able to easily search out the best price for that item regardless of whether that product is offered by the brick-and-mortar store they have visited or a competitor, also seeking out free postage, short delivery times and a convenient payment method. 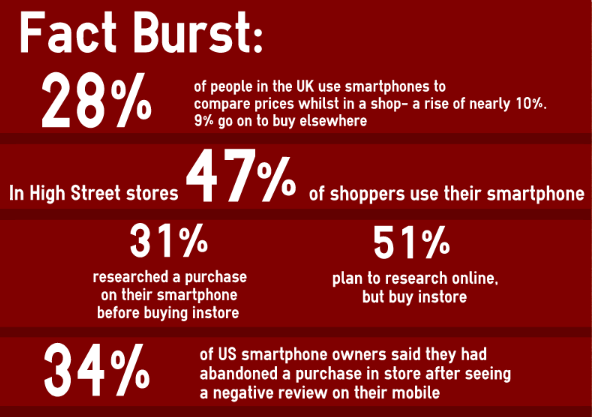 So what can retailers do to reduce or even capitalise on this phenomenon, because one thing is for sure, no one is going to be giving up their smartphones anytime soon. The key to success for retailers is to measure the effects these initiatives have on the in-store conversion rate and adapt their multi-channel and in-store sales strategy accordingly. There’s no reason for retailers to fear or resist showrooming. By moving proactively to offer the kind of innovative, interactive in-store experiences today’s shoppers demand, merchants can stay at the forefront of this fast-evolving trend and drive new levels of conversions and sales. If you have any great ideas or thoughts about showrooming, please get in touch or leave a comment and we can build a full list of the issues and the opportunities.